Paint, sip and have a great time at Bago Tavern - it's fun art for adults! A Paint Your Town class is for beginners and those wanting to explore acrylic on canvas. They'll have a canvas, paint, brushes, even an apron waiting for you. Their artist will walk you through every step of the way so no experience required. Arrive at 12.45pm to get your seat, they'll pour you a wine and get ready to have a good time. Painting begins at 1pm. There will be a designated 20 minute break for drying time and to enjoy a meal together. 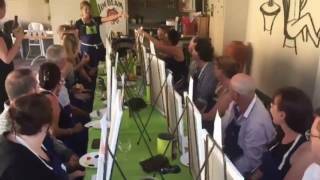 Price includes a wine, your 2.5 hour paint class, canvas, and all paint supplies. Food and drinks sold separately.